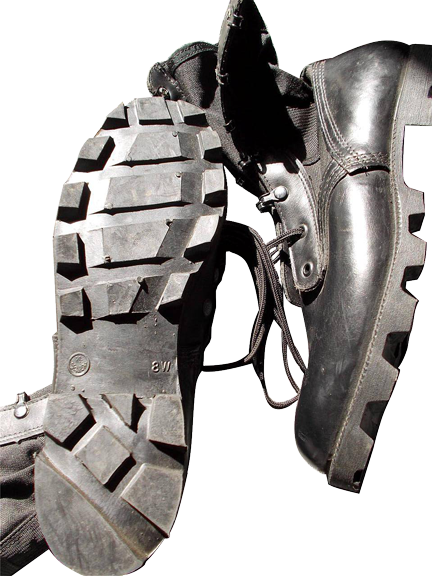 The toe box is the same as the Army Combat Boot ("Boot, Combat, Mildew and Water Resistant, Direct Molded Sole"), as is the heel counter, and Poron® insert. 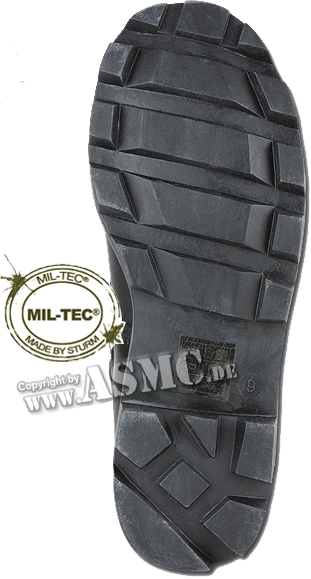 A Panama tread pattern out-sole (Figure 4) is direct molded to the leather insole . A 0.28cm stainless steel plate is inserted between the leather insole, which is split in half and resewn around the edges. The plate extends the entire length of the boot. A zinc-coated steel shank extends from the middle of the heel through the arch and ends just back of the ball area". 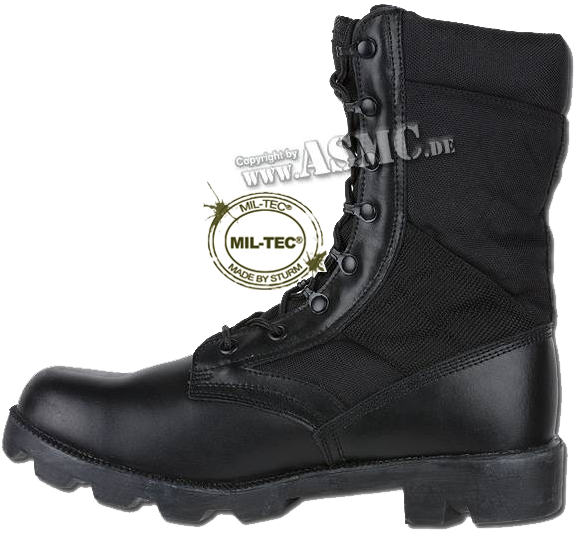 - "Temperate (Infantry) Combat Boot" (with breathing and waterproof Gore-Tex® lining inside), intended to keep moisture out of the boot. The word "Temperate" in the name of these boots means their limited use to environments with temperatures of human body, i.e. 98 F (36.6 C) or less, due to the fact that the lining tends to limit air exchange. After adoption of the ACU (Army Combat Uniform with UCP camouflage pattern) by the US Army and the ABU (Airman Battle Uniform with "Digital USAF Tiger-stripe" pattern by the US Air Force, the black "jungle" boots were also removed from their front-line service for suede leather desert-style boots of distinctive colors (tan and sage green, correspondingly). Wear of the green-and-black "jungle" boots is no longer authorized in the U.S. Armed Forces after April 30, 2008. 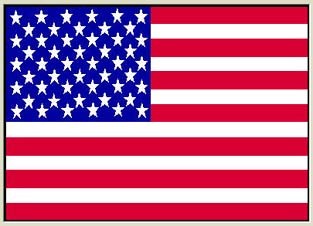 But the armed forces of many other countries outside the U. S. are still using the American-type "jungle" boots. One can not help mentioning multiple commercial "fakes" by "copy-cats", which manufacture just funny copies of black "jungle" boots or just footwear, that looks like black "jungle" boots from some distance. 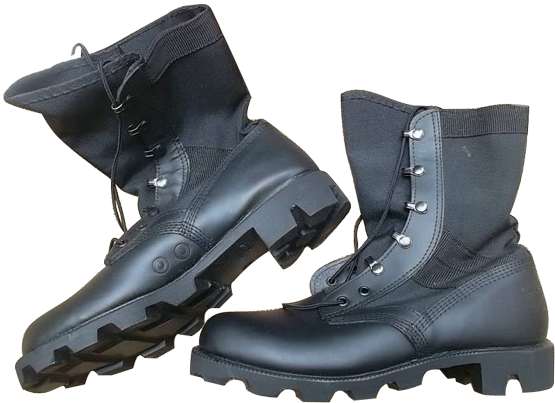 These products can look more or less similar to the real "jungle" boots, but they no way robust, reliable and comfortable nor safe for use while used in harsh terrains. It is often enough to keep in hand a pair of real "jungle" boots and a pair of copies to see the difference. The copies usually last for quite short period of time and they start to disintegrate from the counter (heel cap) area. 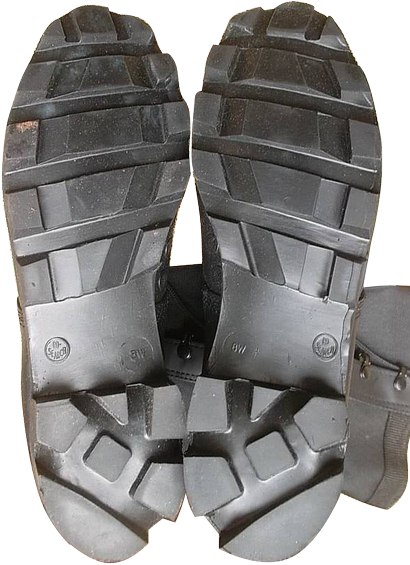 Such boots are not DMS, and the boot's top is just glued to the out-sole. 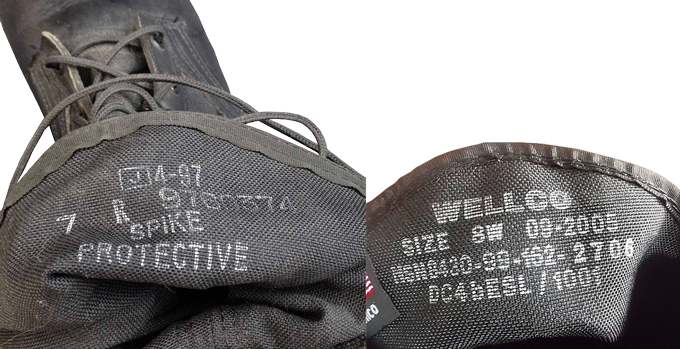 The copies and fakes usually don't have "Ro-Search®" logo on the out-sole, any other markings are missing or very roughly made, the rubber out-soles are softer but more thick. 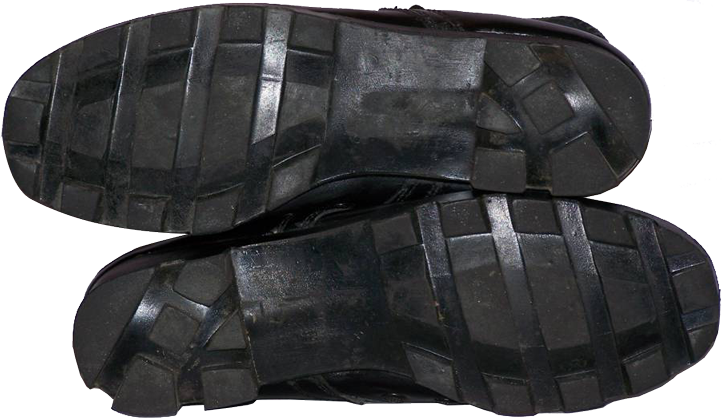 The tread pattern of the heels on some copies (Figure 7) are "inverted". Actually there is no sense or reason in this modification, because these outer margins of the heels are usually exposed to an increased tear-and-wear loads, and these parts of the heels are more thick and strong on the out-soles of the original black "jungle" boots (Figure 8).